By making Tampa pothole repairs, properties will see an improvement in their parking lot appearance almost immediately. Where the asphalt has deteriorated and allowed weather to create cracks, potholes or other damage, CSG can promptly make Tampa repair potholes quickly and efficiently, with virtually no disruptions to your business. The most common type of asphalt repairs are pothole repairs. Tampa business owners must contend with this type of maintenance issue during regular parking lot maintenance. Depending on the severity of the repair, most Tampa pothole repairs can be completed in a day. Our company has been servicing the Tampa pothole repairs needs of businesses for more than two decades. Whether you have a large scale paving project or a small pothole repair, Tampa experts are capable of performing the work. Our crew is experienced and our equipment is state-of-the-art. We are just a phone call or a few clicks of the keyboard away. Contact us today! Our Tampa pothole repairs teams understand that it is critical to the safety and appearance of your parking lot to repair damages quickly and effectively. We have completed Tampa pothole repairs throughout the Tampa Bay area from the downtown section, to the Busch Gardens and USF area as well as in and around Tampa Bay itself. Keeping a watch over your pavement and taking action at key times in it’s lifespan can literally save you thousands of dollars in more extensive repairs or total replacement. 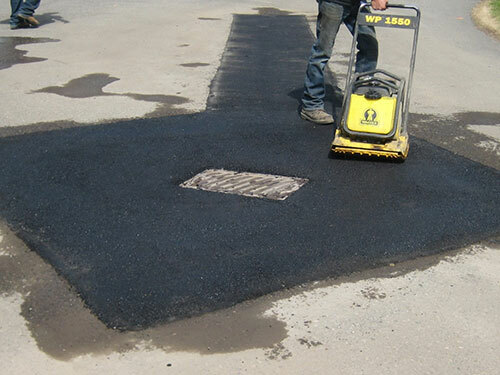 Tampa pothole repairs experts at CSG are a professional asphalt paving contractor that has been servicing the greater Tampa area for more than 20 years. Tampa pothole repairs are needed when potholes form throughout parking lots in various shapes, sizes and depths. Left untreated they will continue to grow as heavy Tampa traffic and intense Florida weather conditions cause additional deterioration. Paved asphalt surfaces are designed to last 25 year on average. To ensure your asphalt lasts as long as possible, preventative maintenance should be conducted on a regular basic. Using a reputable Tampa pothole repairs company, like CSG, ensures the highest material quality and top-notch workmanship that will last many years. CSG never cuts corners. We have been servicing businesses Tampa pothole repairs needs for more than two decades. Whether you have a large scale paving project or a small pothole repair, Tampa experts are capable of performing the work. Our crew is experienced and our equipment is state-of-the-art. We are ready when you are. Remember, CSG for all your Tampa pothole repairs!